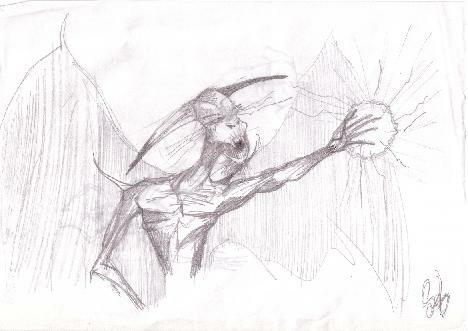 Surely this picture isn't so good, so I think but since I scanned it, I wanted to show you how bad I can be sometimes. Again and again the same kind of demon, a bit thin looking this time. the only thing I like in this picture is actually its worst feature : the lame body ! It looks unnatural at its most but I love twisted bodies. After all i don't see the point painting realistic stuff, better work from scanned photos, hey ! Add comments : wraaap !